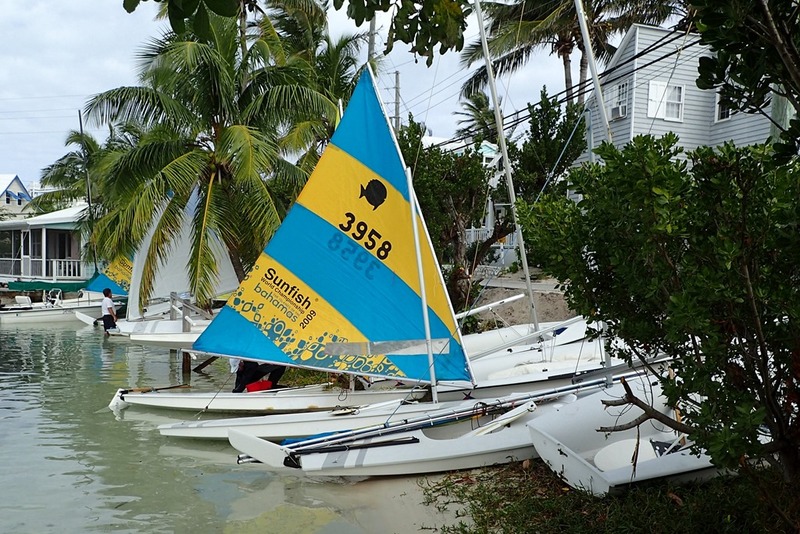 A fleet of Sunfish sailboats is available to members of the Hope Town Sailing Club. 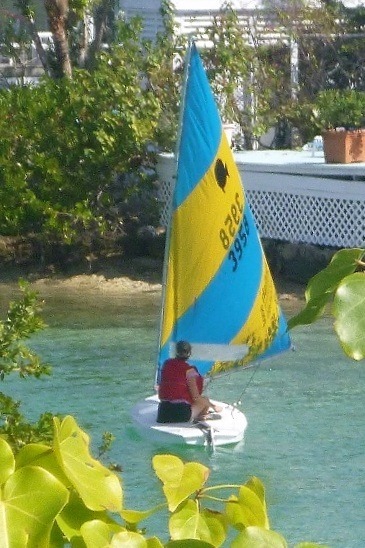 So I checked one out – my first sail in one. 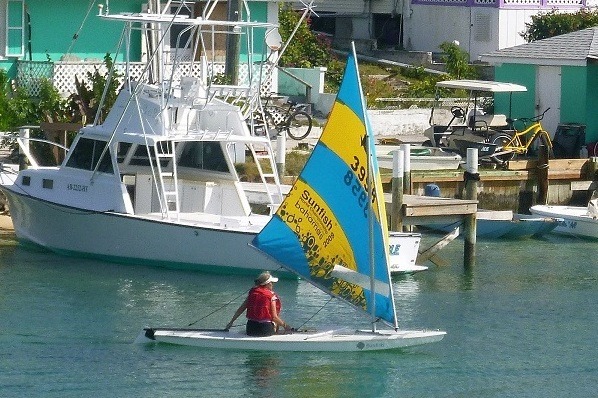 Designed in the 1950s, the Sunfish became such a widely popular 1-2 person boat, it was admitted into the American Sailboat Hall of Fame in 1995. They are raced in fleets all over the US. It’s v-shaped sail is called a “lateen” rig, which allows better performance in light air and downwind. The Sunfish is about 14 feet long and 4 feet wide – with a flat, stable bottom. A modest NW breeze meant I had to tack off the beach at the Sailing Club and all the way out the entrance of Hope Town’s harbor. Back and forth across the little channel, confusing the big boats trying to exit and narrowly avoiding collisions. All this practice tacking before I was even out of the harbor! 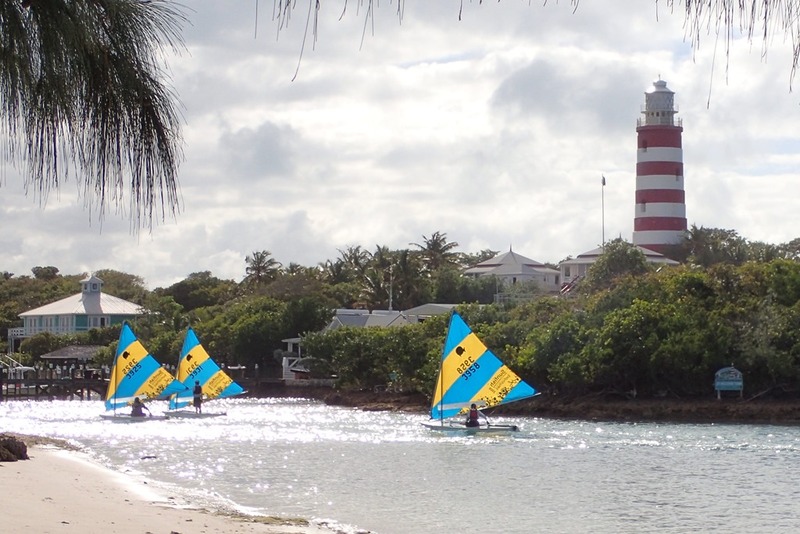 Once in the Sea of Abaco, I tried cruising downwind, jibing, and reaching. I was spared a “practice” capsize. But it’s an athletic boat – for me. Soon I was re-entering the harbor, an easy downwind sail until I reached the end of the channel. In the lee of the Lighthouse Marina, I was practically becalmed. But I soon regained the wind and had a nice sail through the harbor, weaving my way among the moored boats and back to the Sailing Club. Fun. You can’t get much closer to the water than that without being IN it! Windward work isn’t that boat’s favourite point of sail either. Well done! Thanks. When are you coming down here to sail one with me? Impressive! Good thing you’re a sailor lady. I’d be afraid I’d crash into everyone and everything bc it seems like one has no control! You remain my idol. Thanks for commenting. I miss you.